Editor's note: Promises of help to those affected by Superstorm Sandy became more specific Saturday, as officials got a better grip on how to overcome power and fuel shortages. Facing a backlash over initial plans to run the New York City Marathon as scheduled, officials canceled the event. Here is the full story and below is the latest news. [Updated at 10:51 p.m.] President Barack Obama will helm a meeting Saturday morning involving several members of his Cabinet - including Homeland Security Secretary Janet Napolitano, Defense Secretary Leon Panetta and Energy Secretary Steven Chu - and the governors of Connecticut, New York and New Jersey, a White House official said. Top administration members will spend the day in some of the hardest-hit areas, according to the official. Napolitano will to go West Virginia and Long Island, New York; Health and Human Services Secretary Kathleen Sebelius will visit Brooklyn and Manhattan; Small Business Administration Administrator Karen Mills will head to Norwalk and Bridgeport, Connecticut; and Housing and Urban Development Secretary Shaun Donovan will be in the Rockaways and Breeze Point, New York. Homeland Security adviser John Brennan, meanwhile, will be among the federal officials in Staten Island, New York, as well as the New Jersey cities of Hoboken, Newark and Jersey City. [Updated at 10:26 p.m.] The Port Authority of New York and New Jersey said all the airports it oversees - LaGuardia, Kennedy, Newark Liberty, Stewart and Teterboro - "have resumed normal flight volumes." The George Washington, Goethals and Bayonne bridges are open, as is the Lincoln Tunnel. But traffic on the Holland Tunnel is restricted to one tube, and buses only. Some significant challenges remain, however. PATH train services are suspended, and the "Port Authority's maritime facilities remain closed until further notice as recovery and clean-up efforts continue." [Updated at 10:18 p.m.] As of Friday afternoon, more than 98,000 people in New Jersey, New York and Connecticut had registered for federal assistance and more than $40 million in aid has been approved, FEMA said. [Updated at 10:14 p.m.] Recreational vessels still can only enter or leave the Port of New York "to seek safe haven," though there is more movement of ships, tug boats and fuel barges than had been the case earlier, the Coast Guard reports. The Manhattan and Bayonne cruise ship terminals are open, while the Brooklyn cruise ship terminal is still closed. Traffic is moving through Port Jersey Channel and Gravesend Bay anchorage, though Buttermilk Channel "is closed to all vessels not conducting surveys or debris retrieval operations." [Updated at 9:44 p.m.] "Newark Switching Station has been fully repaired," Newark, New Jersey, Mayor Cory Booker said. He predicted many substations would come on line soon and a significant number of city residents should get power back in the next 12 hours - though, for some, it might take four more days. [Updated at 9:34 p.m.] The U.S. death toll from Superstorm Sandy is 106, up from 97 earlier in the day. State Police spokesman Adam Grossman said there were 22 storm-related deaths in New Jersey, where 13 had previously been reported. [Updated at 8:25 p.m.] Con Edison has "passed the halfway mark" toward restoring power to the roughly 910,000 customers left in the dark by Superstorm Sandy, said Senior Vice President John Miksad. With about 450,000 still without electricity, the official called the restoration effort the "most massive" ever in the New York utility's history. [Updated at 8:18 p.m.] Hoping to decrease wait times and curb shortages, New Jersey Gov. Chris Christie signed an executive order Friday tying whether a driver gets gas to his or her license plate number. It goes into effect in 12 counties at noon Saturday. Under the order, on days that end in even numbers - such as November 4, 6 or 8 - gas station operators can sell gas only to those with license plates whose last digit is even. On odd-digit days, such as November 3, only those with plate numbers ending in an odd number or those with specialty plates can get gas. In New Jersey, only station attendants can pump gas. [Updated at 7:58 p.m.] The Defense Logistics Agency, at President Barack Obama's direction, will buy up to 12 million gallons of unleaded fuel and up to 10 million gallons of diesel to bring to the areas hardest hit by this week's storm, FEMA said in a press release. Transported on tanker trucks, the fuel will head toward New York, New Jersey and other areas that are experiencing severe gas shortages in the wake of Sandy. [Updated at 7:37 p.m. ET] President Obama has authorized tapping the Northeast Home Heating Oil Reserve and distributing that fuel to "state, local and federal responders in the New York/New Jersey area," the U.S. Energy Department announced. The fuel - which is loaned by the Energy Department, who will pass it onto Defense Department - will help power generators, water pumps, buildings, trucks and other vehicles. About 2 million gallons of fuel will be drawn down, with the Defense Department expected to replenish the stock within 30 days. [Updated at 6:50 p.m. ET] The group behind the New York City Marathon - which was supposed to happen Sunday but was canceled - will donate supplies to storm relief efforts, the New York City mayor's office says. The New York Road Runners will donate food and supplies from the marathon to #Sandy relief efforts. [Updated at 6:43 p.m. ET] New York City Deputy Mayor Howard Wolfson, speaking to reporters about the decision to cancel this year's New York City Marathon, said that the event was called off because many New York residents weren't behind it in the wake of Sandy. "This year it had became divisive; it was not unifying," Wolfson said. "If all of New York is not behind it as it is every year, then it's (not the New York City Marathon)." Marathon official Mary Wittenberg said many would-be runners had come to New York in the past few days, despite the storm, to show support for the city. She asked for the runners' understanding. "We all think all somebody has to do is turn on the television, and I think we'll have their understanding," she said. [Updated at 6:35 p.m. ET] New York City Deputy Mayor Howard Wolfson clarified to reporters that the New York City Marathon - which was scheduled Sunday but was canceled about an hour ago - will not be held until next year. Asked if officials considered delaying the marathon for a week or two instead of canceling, marathon official Mary Wittenberg said a number of options were discussed, including shortening the race so that it didn't go through certain storm-damaged areas. Wolfson followed up Wittenberg's comments by saying "we did not think at City Hall that that made sense." "The marathon is a five-borough race. … A 10-mile race in a portion of the city is not the marathon we (know and want). We thought it would be better to cancel and have a great marathon next year,” he said. [Updated at 6:08 p.m. ET] The decision to call off the New York City Marathon will make sense to many residents of Staten Island, CNN's Deborah Feyerick reported from New York. The race would have started on Staten Island, where tens of thousands of people still are without power. "Virtually every single person" who talked to Feyerick on Staten Island on Friday, before the event was canceled, expressed outrage at the prospect that the event could happen on Sunday, she said. Piles of flood-damaged debris rest outside many Staten Island homes. Residents told Feyerick that resources that would be used by the marathon should be used to help recovery efforts - for example, buses that were to transport runners there should be used to take cleanup volunteers to the island, they said. "Horrible idea ... disgusting ... that's just some of the words that I can repeat" on TV, Feyerick told CNN's Wolf Blitzer about Staten Island residents' feelings about previous reports that the marathon could go on. “The marathon has been an integral part of New York City’s life for 40 years and is an event tens of thousands of New Yorkers participate in and millions more watch. While holding the race would not require diverting resources from the recovery effort, it is clear that it has become the source of controversy and division. The marathon has always brought our city together and inspired us with stories of courage and determination. We would not want a cloud to hang over the race or its participants, and so we have decided to cancel it. The 26.2-mile course typically winds across New York's five boroughs, but does not include lower Manhattan, where heavy flooding left many neighborhoods in the dark. The race had been scheduled to begin Sunday morning on Staten Island, where runners would have crossed the Verrazano-Narrows Bridge into Brooklyn and run through Queens before crossing the 59th Street Bridge into Manhattan and the Bronx. [Updated at 5:25 p.m. ET] Mayor Michael Bloomberg said Sunday's New York City Marathon will not be held due to damage from Superstorm Sandy. Power company and elected officials hoped power would be restored to chunks of lower Manhattan this evening, Manhattan Borough President Scott Stringer said minutes earlier. Con Edison cautioned earlier that power might not immediately be available in flooded buildings. Earlier Friday, Con Edison said it restored electrical service to 84,000 New York City’s Staten Island customers out of the 139,000-plus customers affected. It also said it was trying to restore power to about 570,000 customers in both New York City and Westchester County without power. According to CNN's most recent count earlier this afternoon, about 3.3 million customers remained without power across 15 states and the District of Columbia. [Updated at 4:40 p.m. ET] Officials in New York have been in meetings to determine whether Sunday's New York City Marathon will take place as scheduled, a New York official who declined to be named told CNN's Deb Feyerick. Another meeting was expected to take place within the next few hours, the official said. [Updated at 4:26 p.m. ET] Manhattan Borough President Scott Stringer says he would favor postponing Sunday's New York City Marathon. As of now, the marathon is scheduled to go on. "There are people suffering in ways that you can’t imagine ... and we want to help out people first," Stringer told CNN's Wolf Blitzer moments ago. He said it was a tough call, and he wasn't critical of Mayor Michael Bloomberg, who has supported having the marathon go on. "I think the mayor wants very much to show the world how resilient New Yorkers are … but I can’t help but think a generator that is serving the media tent in Central Park” would be better served assisting recovery efforts, Stringer said. "In a close judgment call, I err on the side of caution. I've seen too many people waiting in lines for food," Stringer said. Stringer said the city should focus first on recovery, and then making sure people can vote on Election Day, and then, only after these things are done, "we'll throw a marathon the world will be envious of." Bloomberg has said that although the marathon will use up resources, they are not the type of resources that will help much with storm recovery. [Updated at 3:48 p.m. ET] Some public schools in New York City will reopen Monday, the school system says. Schools will reopen on Monday. Depending on power conditions, we expect about 40 school buildings will not be able to reopen. Earlier today, CNN affiliate NY1 reported that eight high schools still will host evacuees on Monday, even if classes resume there. [Updated at 3:30 p.m. ET] The number of deaths believed to be connected to Hurricane Sandy has risen to 97, according to state and local officials, up from CNN's previous count of 96. The latest death to be reported comes from New Jersey, where 13 fatalities have now been reported. The count also includes 48 in New York state; 13 in Pennsylvania; 10 in Maryland; four in Connecticut; five in West Virginia; two in Virginia; one in North Carolina; and one on the HMS Bounty. Deaths from Sandy also have been reported in Canada (two) and the Caribbean (67), bringing the total to 166. Earlier today, Con Edison said it restored electrical service to 84,000 New York City’s Staten Island customers out of the 139,000-plus Staten Island customers affected. It also said it is trying to restore power to about 570,000 customers in both New York City and Westchester County without power. [Updated at 2:24 p.m. ET] New York City's subway operator has released a map of where service has been restored as of Friday. Jodi Kaplan told CNN's iReport.com that she rode a line that reopened Friday - Bronx to 34th Street - and that it "makes me feel like I am not trapped anymore." "It feels like a trolley cart, there is only one line running,' she said. "It is huge and significant that some parts are starting to open." [Updated at 1:57 p.m. ET] New York Mayor Michael Bloomberg says blood donations are needed. [Updated at 1:38 p.m. ET] More than $18 million in federal aid money has been dispersed so far, FEMA Administrator Craig Fugate said Friday. Much of that is in the form of rental assistance, which can extend for up to 18 months for those with major home damage. “A lot of folks who flooded did not have flood insurance,” Fugate said. [Updated at 1:34 p.m. ET] The Red Cross has 4,000 disaster workers across storm damaged areas, with thousands more en route from other states, Charley Shimanski, the organization's vice president of disaster services, said Friday. Nearly 7,000 people spent the night in emergency shelters across the region, including 30 shelters that opened in New Jersey, he said. [Updated at 12:52 p.m. ET] At least 3.529 million customers remain without power, according to numbers provided by local providers. [Updated at 12:42 p.m. ET] Trillions of dollars worth of stock certificates and other paper securities that were stored in a vault in lower Manhattan may have suffered water damage, CNNMoney reports. [Updated at 12:37 p.m. ET] Rangers are trying to find a hiker stranded on the Appalachian Trail in Great Smoky Mountains National Park by snows from the storm, CNN affiliate WBIR reports. The hiker was able to make a cell call to police in Cherokee, North Carolina, on Thursday afternoon, according to the report. Rangers were dispatched to try to find the hiker, but they had to stop in a cabin overnight after walking nine hours and encountering snow drifts up to 5 feet deep, the report said. Officials are considering a helicopter rescue after the hiker called police Friday morning to say he had made it through the night by may not be able to walk out, the report said. [Updated at 12:23 p.m. ET] To make it easier for fuel to get into storm-damaged areas in the Northeast, the federal government has temporarily waived requirements that normally allow only U.S.-flagged ships to carry fuel into Northeastern ports. The Department of Homeland Security has waived the Jones Act through November 13, allowing non-U.S. flagged ships to transport oil and gas from U.S. ports in the Gulf of Mexico to ports in the Northeast. The waiver is in the interest of “removing all the roadblocks and to make it as simple as possible,” a department spokesman said. [Updated at 12:18 p.m. ET] New York Gov. Andrew Cuomo signed an executive order waiving the state's requirements that fuel tankers register and pay a tax before unloading, he said in an afternoon press conference. This has been done to "accelerate the flow of gasoline," Cuomo said. [Updated at 11:57 a.m. ET] County coroners in Pennsylvania have now reported 13 deaths believed to be related to Sandy, up from our previous count of nine, according to the Pennsylvania Emergency Management Agency. That brings the U.S. death toll to 96 and 165 on Sandy's full path from the Caribbean to Canada. [Updated at 11:32 a.m. ET] Con Edison has restored electrical service to 84,000 Staten Island customers, according to a press release. 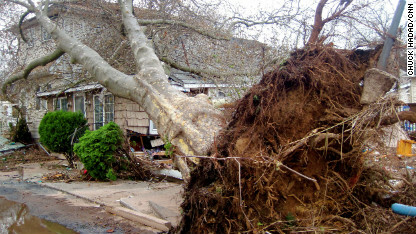 More than 139,000 Staten Island customers were affected. [Updated at 11:18 a.m. ET] Businesses had contributed more than $33 million in donations to Sandy relief as of early Friday, according to a tally from the U.S. Chamber of Commerce Business Civil Leadership Center, CNNMoney reports. For more information on how you can help, see CNN's Impact Your World. [Updated at 11:13 a.m. ET] The World Health Organization says 22 cholera treatment centers in Haiti were damaged by Hurricane Sandy and an increase in cholera alerts is being seen. Read more here. [Updated at 10:52 a.m. ET] The Department of Energy reports 3.6 million customers without power across 11 storm-affected states as 9 a.m. ET. [Updated at 10:29 a.m. ET] The recovery is under way in New Jersey. [Updated at 10:27 a.m. ET] Here's a daunting thought for storm recovery efforts. [Updated at 10:24 a.m. ET] There have been more than 100 altercations in gas station lines in Nassau and Suffolk counties in New York since Thursday, Long Island Newsday reports. [Updated at 10:17 a.m. ET] The National Weather Service has two warnings for people in the New York-New Jersey area for the next week: it's going to get cold and more rain, snow and gusty winds may be on the way. Temperatures are expected to drop into the 30s beginning tonight through the next week. "Those without power should be prepared for a number of cold nights ahead," forecasters said Friday. In addition, a new coastal storm may hit the area next week. "This storm has the p0tential to bring strong gusty winds, rain/wintry precipitation, and coastal flood," the weather service said. [Updated at 9:28 a.m. ET] A United Nations official says Hurricane Sandy has left as many as 1 million people in Haiti facing food shortages. "We fear that a great deal of the harvest which was ongoing in the south of the country may have been destroyed completely,” Johan Peleman, head of the UN Office for the Coordination of Humanitarian Affairs’ operation in Haiti, said in a U.N. News Center report. The nation's food supply was suffering from drought and the effects of Hurricane Isaac, which hit the country in August, before Sandy hit, he said. Plus, Haiti has 350,000 people living in camps established after a massive earthquake in January 2010 and those people still face problems getting enough food. [Updated at 9:11 a.m. ET] A small piece of good news for New York City commuters. This morning, nearly 7,400 #NationalGuard members are supporting #Sandy response efforts in CT, DE, MD, NC, NJ, NY, PA, RI, & WV. [Updated at 8:40 a.m. ET] Five people have died of carbon monoxide poisoning in New Jersey since Monday, the Star-Ledger reports, as residents use gas- or diesel-powered generators to provide electricity in storm-damaged areas. [Updated at 8:09 a.m. ET] Finding gasoline remains a problem in New York and New Jersey, CNNMoney reports. Only 40% of the 2,944 gas stations tracked by AAA in New Jersey have power and are operational, according to Robert Sinclair, New York spokesman for the motorist group. He said only 35% of the 1,472 gas stations tracked by AAA on New York's Long Island are operational. [Updated at 8:04 a.m. ET] In Crisfield, Maryland, flooding from Sandy has actually pushed coffins up from their graves, CNN affiliate WMDT reports. "It's an airtight seal. When it's surrounded by water like that, the displacement of that coffin can actually lift that concrete lid right off," Philip Goldsborough of the Crisfield Volunteer Fire Company told the station. [Updated at 7:54 a.m. ET] There are massive traffic backups on the Atlantic City Expressway, which connects the Jersey Shore to the Philadelphia area, this morning as property owners try to get to the shore to check on their holdings, CNN affiliate Philly.com reports. [Updated at 7:18 a.m. ET] In the wake of Superstorm Sandy, banks are offering short-term loans and emergency credit limit increases to many East coast residents. Read the CNNMoney report. [Updated at 7:13 a.m. ET] About 1.6 million customers in New Jersey are still without power on Friday morning, CNN afflilate News 12 New Jersey reports. [Updated at 7:06 a.m. ET] Eight New York City high schools are expected to hold Superstorm Sandy evacuees and classes come Monday morning. CNN affiliate NY1 reports. [Updated at 6:24 a.m. ET] More than 3.3 million customers in 15 states and the District of Columbia were still without electricity early Friday in the aftermath of Superstorm Sandy. [Posted at 6:19 a.m. ET] Superstorm Sandy did between $30 billion and $50 billion in economic damage, the catastrophe risk modeling firm Eqecat estimates. Insured losses will be between $10 billion and $20 billion, the firm says. Before the storm made landfall, the firm estimated Sandy's total losses at $10 billion to $20 billion. Read the CNNMoney report. So this whole storm and its after effects are Obama's fault? Really??? Give me a break!!! Why do superstorms happen only in the US? Its because of their karma for being the largest producers of greenhouse gases per capita which cause global warming and climate change. It would helpful if one knew the meaning of Karma. What YOU do doesn't affect MY Karma, but it sure as heck does affect YOURS. Aren't you cleaning up from a massive storm in India yourself? Weather happens...Karma doesn't apply, and all of your data and plat itudes and the misuse of the word Karma doesn't help anyone feel better, or make them feel any less bereft at all they have lost. People should exercise a little common sense and look up the definition of "empathy" when talking about an event that affected the eastern half of the US. I shouldn't be surprised at the pettiness I see here; somehow, I still am. So what are Romney and his cronies like Guillianny doing in this disaster?? Trying to win points at the expense of the victims by blaming Obama for everything from Katrina, when he wasnt president to This disaster. where is Romney with all his millions in off shore accounts and his billionaire buddies in this mess? They are high in the hog blaming Obama who had to suspend his campaining to be here with the victims whild romney and the republicans didnt even bat an eye to help their fellow republican in New Jersey. I havent heard of Romney taking time to come and offer anykind of assistance? He wants to be presient? He is not presient materiat he is just a whiner. "OH AMERICA (mommy) look what Obama did now!!!. Bohoo hoo hoooo" Im changing my vote to Obama. He is not a whinner, whatever else he may be. Only in a country like ours do people have the opportunity to so blatantly show their ignorance by politicizing a storm and the loss of lives. Obama has stepped up to the plate and done his job. Romney has used this horrible event causing so much heartache to so many people to tell people how he could have done it better by using his privatized (aka 'for profit') resouces to provide the same services. Hurricane Sandy (R) or Hurricane Sandy (D). Pablo do you vote for the President or his administration they are both incompetant. And Cool B he is only one man but the most poweful in the world. Tell me what you could do not what you can't. By the way if his wife and VP get off the campaign trail and join him at the White House he might not be alone and maybe perhaps one of them may have and idea or two since he cant come up with a plan. Like telling us a peach is a vegetable. Not rocket science basic needs!! Giuliani and Bush are doom kom poops. Obama and Bloomberg are handling this way better than Katrina. I know it's true: I read it on C N N.
Some genuinely nice and utilitarian information on this website, likewise I believe the pattern has got excellent features.